If you are looking for the next step up from your smartphone or point and shoot camera, it’s probably time to take a look at DSLR (Digital Single Lens Reflex). 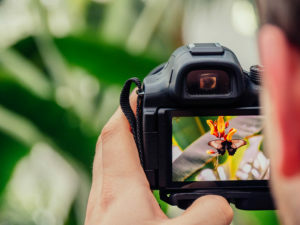 Whether you are interested in photography as a hobby, want to make a living from it, or just want to take professional-looking pictures, a DSLR camera is a must-have. DSLR cameras are complicated, though. There is an entirely new language to learn, and getting good pictures from a DSLR camera depends as much (if not more) on technical skill as it does on the camera you use. For that reason, you’ll see many experts explain that you don’t need to start with the most expensive camera out there. Entry-level cameras are not only affordable, they are also designed to help new shutterbugs learn how to shoot. 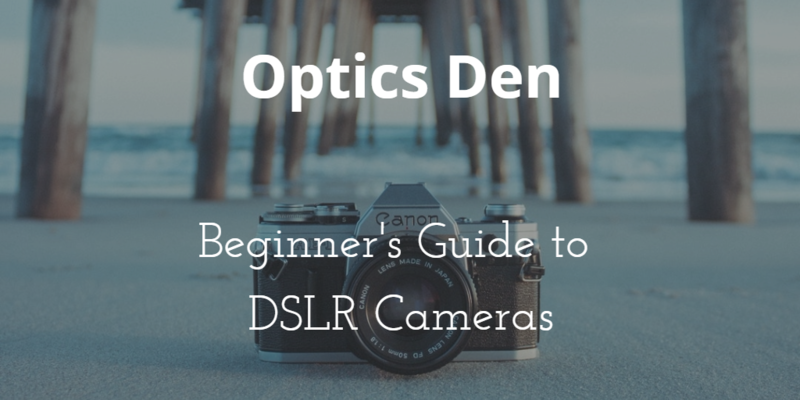 In this guide, we’ll take a look at DSLR cameras to help you understand what you’re getting yourself into and how you can approach the buying process. DSLR cameras use digital formats (rather than film) and are superior over point and shoot digital cameras in both quality and options. DSLRs use built-in mirrors and interchangeable lenses, which makes them the best choice for anyone hoping to enhance their photography. It’s the interchangeable lenses themselves that really set DSLR cameras apart. Our smartphones continue to provide us with expanded options in terms of quality, focus, and artistry. But DSLR cameras have numerous lens options so you can choose the lens that best fits your specific needs – beautiful portraits, far-off landscapes, wide-angle architecture, macro. Aside from artistic shots, different lenses will produce great results for things like product shots (for your website, blog, or Etsy shop), sports, and video clips. When you change out your lenses, you also have several options within the camera itself. This is where the DSLR and camera terminology comes in. You’ll see options like ISO, AF, F, TV, Raw, and more. What do these even mean? Let’s talk about some of these features next. What are the Features of a DSLR Camera? There are a ton of features available on today’s DSLRs. When you start shopping around, you’ll see the specs of each camera. Without knowing what all those terms and numbers mean, it probably looks like a completely different language. In fact, it can feel a little isolating to read up on camera specifications because the language is so technical, and newbies have a hard time understanding the implications of any of the terms. Here’s a crash course on a few of the most common terms you’ll see related to DSLR cameras. This term is an important one once you start shooting. Aperture is simply the size of the opening on the lens’s diaphragm, and it regulates light passage. When you adjust aperture on your camera, you’ll change the f/stop. Aperture can get a little confusing because the lower numbers are actually wider openings (more exposure). So, for example, if f/1.4 is the lowest available aperture on your camera, it will give you the biggest opening in the lens, and, thus, the most light. The nice thing about learning aperture and depth of field is that it’s an easy setting to play with. There are also many articles online that explain the differences in depth of field and provide example pictures with various f/stop settings. When you buy a DSLR camera, aperture isn’t something you’ll worry about in the specs. Having a wider range of f/stops comes from additional lenses that you might buy later on. When it comes to “focus” in DSLR, we’re usually talking about the camera’s autofocus (AF). Some (though not many) entry-level cameras don’t have a manual focus, though, and we recommend avoiding those. Manual focus isn’t necessarily something you’ll use every single time you shoot, but it’s nice to have and gives you control over the subject in focus whenever you need it. Autofocus is a pretty crucial part of your photography, so it’s worth it to check on the camera’s autofocus ability. In specs and reviews of cameras, pros talk about the “sensors” that function in AF. The speed and accuracy of AF are the most important parts of the function, and have added importance if you intend to rely on AF frequently (especially for action shots, wildlife shooting, sports, kids playing – you get the idea). While autofocus depends heavily on the subject, particularly the light level and contrast, but you should still be able to figure out whether the camera’s AF is good or lacking. You can absolutely read up on the AF reviews and specs of the camera you are considering, but if you have the means to play around with the device before you buy, that’s even better. You can test to see for yourself if the autofocus tends to operate quickly or lag, and whether it seems to focus on the subject correctly or not. Not having a good AF can make for an extremely frustrating photography experience, so it’s well worth it to do a little homework. You’ll see that “good” AF is typically based on the number autofocus points, but you’ll spend quite a bit more for cameras with lots of points, so don’t base your entire decision on that. Like aperture, ISO is connected to the light. The difference is ISO decides how sensitive the image sensor is to light. In ISO, the lower the number, the lower the sensitivity. This makes it a bit less confusing than aperture! An ISO of 100 will always be the lowest available option on your camera and is generally a good setting for bright light, daytime, and so forth. Choosing higher ISO settings tends to mean more noise (graininess and discoloration) in the shots. ISO ranges vary from camera to camera, but it’s another good area to check out before you buy. Nearly any camera you’re considering should have some info online with pictures taken at different ISOs. A camera that produces noisy images at a relatively low ISOs might not be a good investment. If you know you will be shooting frequently in low light, it might be worth spending a bit more to get a camera that is rated well for higher ISOs. ISO settings are organically tied to shutter speed and aperture, too, so it does take a bit of time to figure out ISO settings. Using manual ISO isn’t a bad idea at all – it gives you a chance to learn some of the other settings before worrying about this one (which can be tricky). Megapixels get a lot of attention when it comes to assessing the quality of a DSLR. Megapixels relate to resolution and are simply a unit of measurement for the number of pixels. However, megapixels also relate to file size, and more megapixels create larger digital files. This means you’ll need more memory for more prints, and it also means it’s more time consuming to send or upload photos. Resolution matters, of course, but for the most part, entry-level cameras will have a fairly standard range. Even getting into mid-level cameras you’ll see most of the big names and lists of “best” cameras will be pretty close. Add that to the fact that more isn’t always better when it comes to megapixels, and you’ll find that it all is pretty confusing. When choosing a DSLR camera, you will want to take megapixels into account, but that isn’t the be-all, end-all of camera buying. In fact, the sensor tends to be more important (more on that later). Manufacturers like to tout high megapixel counts, and in some cases, it may give them a competitive edge. But when we’re talking about new DSLR users, this shouldn’t factor much into your decision. Higher megapixels often mean higher price points, and for your first camera, there are other features that should influence your decision much more. Metering is yet another term that relates to – you guessed it – light. What you need to know about it at this stage is just this: it helps guide exposure, and you can change the way the camera reads the light. Matrix metering reads the light from the whole shot. Center-weighted measures the middle of the frame only. Spot metering is simply reading the light based on your focus. Metering is actually a relatively simple setting to figure out, but it’s also something you don’t have to worry about too much to start with. It’s also standard, so it’s not a feature to concern yourself with when you’re shopping for your new camera. When you first start shooting, you’ll probably find yourself relying on the camera’s ability to sense settings. This means you should start out in Auto mode. Your camera’s auto mode will set everything up for you: ISO, f/stop, shutter speed, etc. This enables you to take the camera right out of the box and start using it. If you’ve spent any time around photographers in person or online, you might already have a kneejerk reaction to AUTO MODE. If that’s the case: STOP IT. There’s nothing wrong with shooting in Auto mode, especially when you’re learning! Your DSLR is smart, and it can configure all the settings for you so you can work on capturing the shot, or playing around with manual focus. Plus, your camera will record all the settings it uses for every shot, so you can get to know what you like and which to use when moving to manual or semi-manual. Sensors matter when buying a DSLR, at least to some. As we mentioned, megapixels don’t always matter quite as much as many would have you think. Sensors, on the other hand, can make a big difference in quality based on the sensor size. You might notice some different types of sensors when considering DSLRs, like CCD and CMOS. There are new trends in digital photography that can affect the quality of the sensor, but for now what really matters is size. The sensor size listing may vary from manufacturer to manufacturer, but overall, the bigger the sensor, the better (you can decide how to interpret size). This is another category that deserves a bit more research when you start narrowing your choices. If you’re on a budget, a slight size difference in sensor may not matter quite as much as some of the other features. No matter what, just keep in mind that sensor size and megapixels should be assessed together. You might play with shutter speed using Shutter Priority mode and notice which settings the camera defaults to in order to catch your shot. This can help you get to know the delicate balance of ISO, aperture, and shutter speed. Oftentimes, when people have made the decision to purchase a DSLR, they want to know exactly which one to get. There are two major brands that make up the majority of DSLR business – Nikon and Canon. You’ll find die-hard fans on both sides, and there’s no shortage of convincing arguments for either brand. They aren’t the only brands, however – Pentax and Sigma also have DSLR offerings. Photographers tend to become fiercely loyal to their preferred brand, so asking around or doing some internet research will help you find some passionate views about particular brands and models. Okay, So, Which Camera Should I Buy? Here’s the thing: there’s no one PERFECT camera. There’s probably going to be a perfect camera for you, but to figure that out, you’ll want to do some research. How much do I actually expect to use this camera? What will I primarily use it to shoot? Will I use it for action, portraits, low light, astronomy, etc.? How much of that do I want to use on add-ons, accessories, lenses, etc.? From there, you should be able to narrow down some specifics – your price range, for example, will help you identify a selection pretty quickly. If you want to spend less on the body and use some of your budget to get lenses or other extras, that will limit you a bit. If particular features really matter (say, frames per second or video recording), that can help you further narrow your scope. Definitely read lots of viewpoints about “best” cameras. You’ll see that there’s often plenty of agreement about which cameras are worth the money. You’ll also find people making strong cases for or against those same models. Above all, choose the camera that speaks to you and seems to fit all your criteria. Don’t worry about brand names or specs you don’t really need. Plus, nearly any DSLR camera you get will be such a big improvement from your smartphone or point and shoot that you’ll have plenty to be excited about. As we mentioned above, you might feel inclined to set some of your budget aside for add-ons, extras, gear, and so forth. Before you buy anything, keep in mind that you’ll always want more gear. We’ve yet to meet a photographer who doesn’t want some new lens or flash or other gear. And, gear is just a tool. To take great pictures, you have to learn how to shoot DSLR first and foremost – the fanciest gear isn’t going to do much if you don’t know how to use it. How Can I Learn to Shoot DSLR? Now you just need to learn to use the darn thing. First, don’t be scared of it. Simply taking the camera out and using it to shoot as many bad photos as possible helps you get to know your camera. Plus, there’s always a good chance you’ll accidentally get some great shots. Next, keep shooting! Use it all the time. Try new settings and modes. Read online articles about using your particular camera. Learning to shoot DSLR takes time, so don’t be discouraged if you’re still using auto settings several months in. There’s no shame in that! If reading isn’t working as well for you, check out some YouTube videos, enroll in an online workshop or class, or check out photography classes at your local university or community college. There are many ways to learn how to use your DSLR camera. Above all, have fun with you new camera!